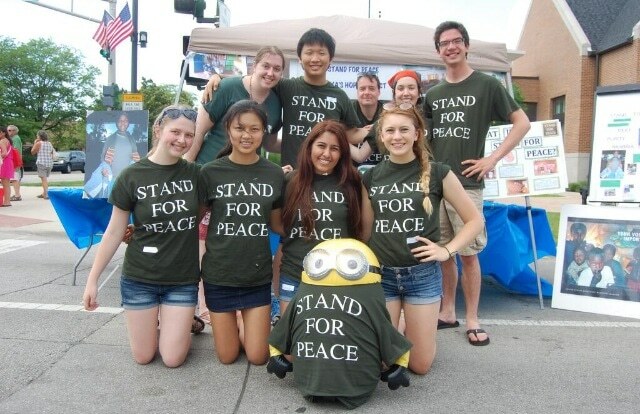 Students from Glenbrook South High School’s club STAND for Peace worked together a few weekends ago at Glenview’s Summer Festival. The club fundraised this spring to sponsor a Matanya’s Hope child and were out again working to keep their child in school. 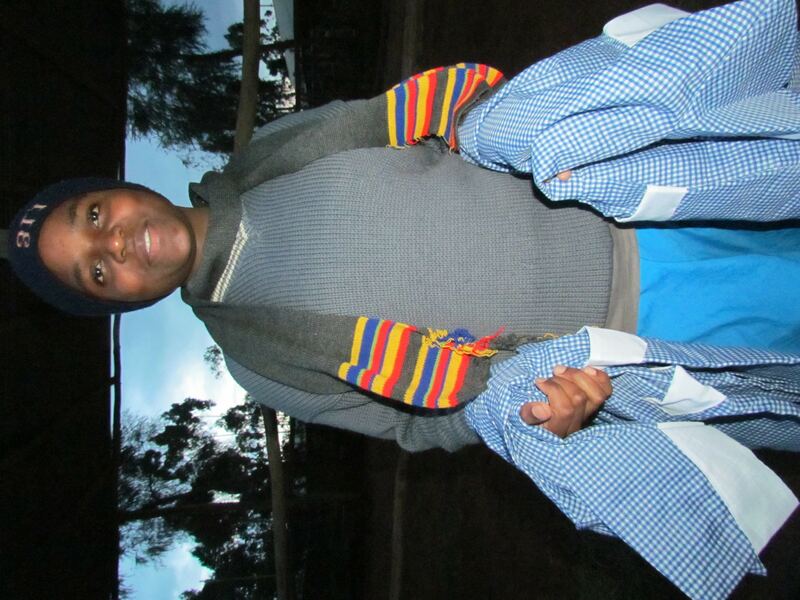 They are currently sponsoring Purity Nkabria, a girl entering high school thanks to their hard work. Purity is an extremely bright student who wouldn’t have been able to attend school beyond eighth grade without a sponsor. 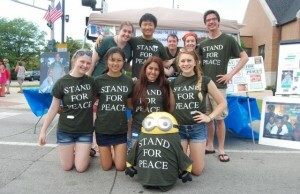 Stand for Peace is a global outreach club that began as Students Taking Action in Northern Darfur thus the STAND name. Over the years, as the genocide ended in Darfur they have moved on to focus on five areas of the world in need of humanitarian aid. The club focuses on human rights crises and takes a non-political stand to help make a difference to better lives. This year they raised money for Syrian refugees, which was donated to the United Nations High Commission for Refugees (UNHCR) in the fall. Their spring project was Matanya’s Hope. The club has committed to get Purity through her education as she already lost a sponsor before the club became involved. They also sent over a backpack full of donated school supplies for Purity at the end of the school year. The Student executive board of STAND is currently made up of Ruhi Bhaidani, Kate Hegay, Grace Kilpatrick and Maeve Plunkett. The faculty sponsors include Matthew Whipple who won the Power of One award from the Illinois Holocaust Museum earlier this spring for his work with the club and activism. The club is run by students who choose what projects to work on while the faculty help to ensure productivity with the students. Matanya’s Hope is extremely thankful for the hard work the students of the club have put in to make enough money to sponsor Purity. The student board was at the festival all day on Saturday and members of the club worked throughout the day in shifts. 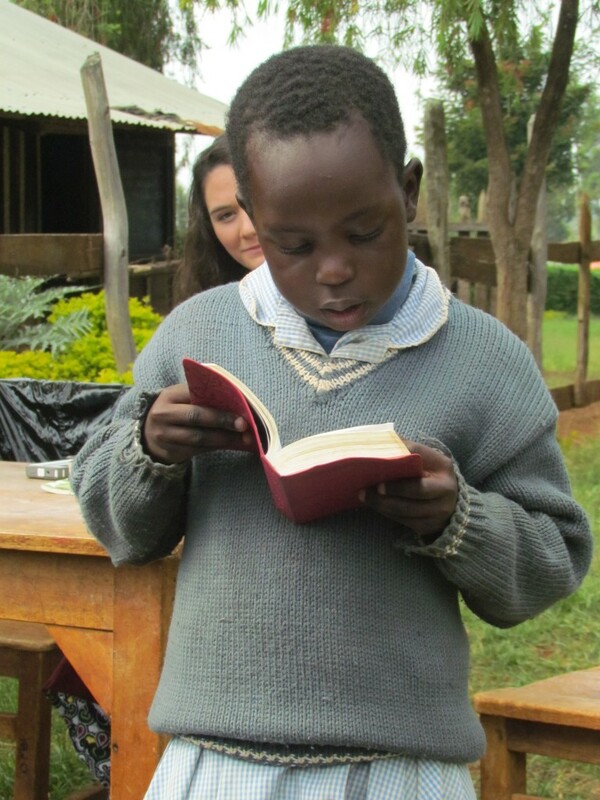 One member of the club will be traveling to Kenya this year with Matanya’s Hope. 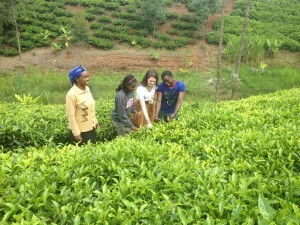 Stay tuned and hopefully hear a blog from her about her experience in Kenya. This entry was posted in Uncategorized on July 17, 2014 by Maeve Plunkett. The zeal to give back to the society is never a task for all. But for those who set out this summer, the experience has been life-changing, creating memories of the smiles and good times that the Journey to Africa gave to us. This big journey has been more fulfilling than taking a vacation. In our minds, we knew that it was not going to be easy – especially for the long journeys that awaited ahead. But with bold hearts, dedicated souls and unwavering spirits, we set out. Two of the greatest comrades for the Journey set their feet in Africa and Kenya to be specific on June 3, 2014. 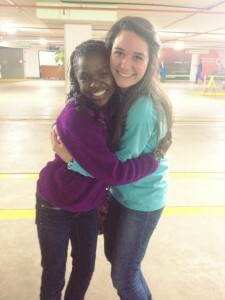 It was Lilian Muthoni Gatheca and Kelsey Spencer. They knew that what had to be done required a determined heart. With beaming faces they looked ready. To Kelsey, arriving at VICTORY was a long awaited dream that had finally come true. After 6 hours of driving and sightseeing through Kenya’s eastern countryside, we set our feet in Meru. We arrived late in the evening. We were as we were greeted with a warm welcome from the host family and of course, our greatest surprise was to also be able to meet the lovely VA kids. Lilan, Kelsey and I had to see the kids and share warm hugs together. What a welcome! To Kelsey, I can only imagine how it must have been a surprise to see the new life in Africa and to experience the evening preps in our Kenyan setting. From the dusty classrooms and with jumbled sitting arrangements came the most beautiful smiles. Having done her homework well, Kelsey did manage to say ” Jambo” meaning” Hi” and the smiling VA kids were shocked to see a “mzungu” Who knows Swahili. Our first night was general introduction and Kelsey and Lilian all looked forward to the next day – when they would be able to spread their love to the kids. Luckily enough, the following day was the Agricultural Exhibition Show. The show is always a great avenue for the many regions to show case their agricultural produce and all other achievements. It’s always right for the primary and high school students to attend such shows and learn a couple of things and VA students were not an exception. This was a great avenue for Kelsey and Lilian to learn with the VA kids. Walking all around the showground was eye-catching especially to many in that place who saw Kelsey! As a white person in a Kenyan academic setting, the children indeed found her a fascinating person to watch! After a couple of 4-wheeled motorcycle rides and a merry-go-round ride, we were all set to end the day. Kelsey and Lilian decided to use the school bus to ride with the kids and this was so welcome from all! 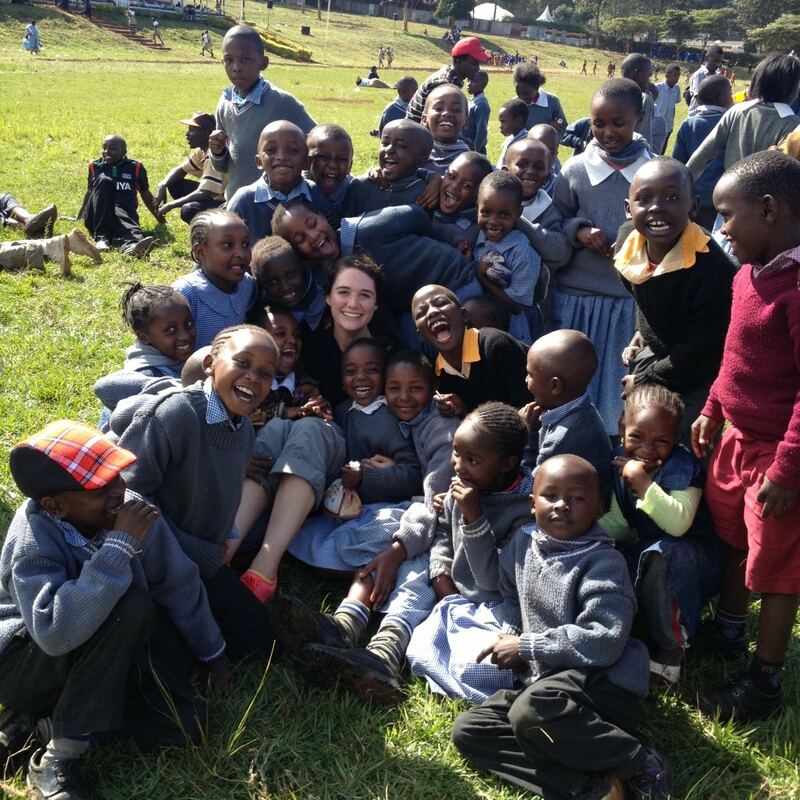 It was a chance for Kelsey to experience the boarding and trip effects that many Kenyans find themselves longing for but may never have the means to experience. Each day at VICTORY was a new challenge and excitement to look forward to; each one holding a different project for Kelsey. Amongst her most favorite of experiences was milking Kenyan cows; she had to wake up with Mama Diana at 5am to go milking. Once done, they had to carry the many liters of milk in a silver pail to market. What an exciting moment that was! Picking tea at Mama Lisper’s home was also an existing experience; needless to say the sugarcane eating at a neighbor’s was a sweet and welcome treat! Kelsey did experience what it means to eat sugarcane with bare teeth. Am sure she’d say, that required strong jaws. At VA we had a great program and, for Kelsey and Lilian, being part of the teaching staff was amazing. While I taught class 8 math, Kelsey and Lilian taught 6th, 7th, & 8th grade students Christian Religious Education (CRE). The kids always looked forward to our lessons and we also looked forward to teaching them. The evenings had different programs ranging from storytelling, movies and and personal life stories from the three of us. Since boyhood, my life had unfathomable challenges and this year, I took time to express to the students that despite all of the hardships I faced, I have reasons to move on and to embrace life. The Glow family sent Lilian with a movie by the title FROZEN and this movie made us laugh all through. The snowman, Olaf, in the movie left our ribs aching from laughter. What great moments! Michelle Stark, Founder of Matanya’s Hope, and Faith Watson joined us on June 12. Now, the biggest task of unpacking 65 fifty pound (72 kilo) duffle bags had to be done. The Mission team comprised of Michelle, Lilian, Kelsey, Faith, Michael and I worked so hard and by the end of 14th of June 2014, all the gifts and donations were well sorted. Over 100 blankets, 40 book bags, bibles, soccer balls, shoes, clothes, coats, thousands of toothbrushes, pens, pencils and so much more were ready to be distributed to those in need. 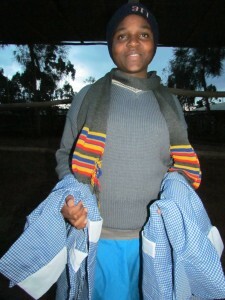 What a great job Matanya’s Hope does! 9 years and yet Michelle pushes on to assure that the African child will have a reason to smile and hope of a better future. There is no better way of saving the world than through SAVING ONE CHILD AT A TIME. Attending a church service at VICTORY is indeed one incredible life experience. The kids lead the service, full of life and joy singing and sharing of the word of God. It is humbling. We enjoyed songs and choruses, which left many of us still singing – and feeling so grateful for this great and merciful God of ours. Victory Academy was a great place to get to know Kenya and the hearts of Kenyan students. None of us wanted to leave Meru but Nanyuki was waiting. So much more was waiting only hours away! Finally, we set out for Nanyuki. Travel was another treat as we circled the perimeter of the famous 5199M high Mt. Kenya. The climate went from lush green carpets of tea and banana to a desert like carpet of dust and brush within 3 hours; we arrived in Nanyuki. We traveled an additional 20km into the interior of Nanyuki, arriving at a place called Matanya, where Mr. And Mrs Mugo embraced us. In their humble home, all were welcomed and the first part of the night program became a cherished, traditional footbath. Their hearts were cozy and Mrs Mugo made us the first dinner. Soon, Nanyuki became another home. Our first stop the next morning was Irura Primary School – an impoverished rural day school where Mrs Mugo is a teacher. Much thanks to donations from Mother and Daughter team: Stephanie Kazuba and Lucyna Czuba, we participated in serving the kid’s porridge. 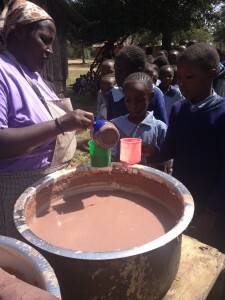 These pupils are able to enjoy a cup of nutritious and hot porridge between 10-11am every day. The majority of these students come from such disadvantaged backgrounds that even one meal a day becomes an impossibility. Porridge is made from freshly ground sorghum, amaranth, millet, finger millet and maize and cooked over an open fire. Approximately 200 students are fed every day at this school. This year, we were blessed to be able to unveil one of the greatest additions to The Porridge Program: MICONUTRIENTS. 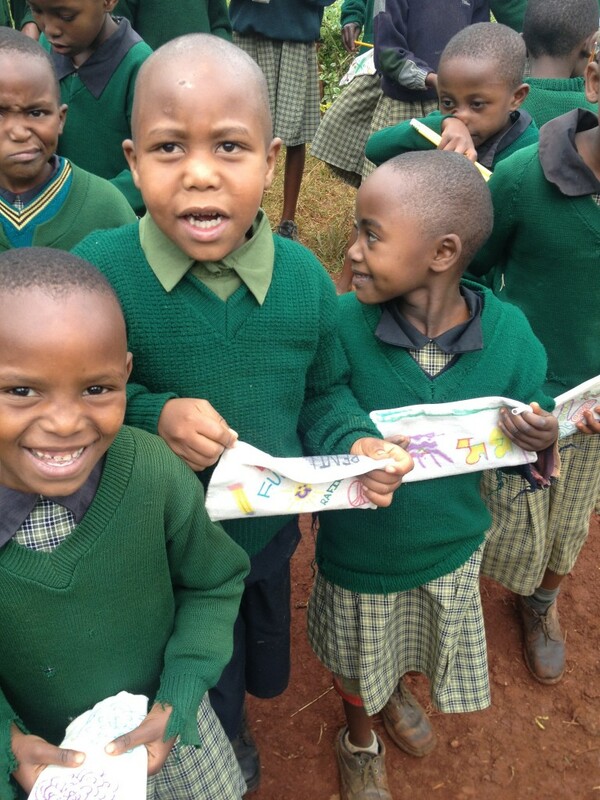 Matanya’s Hope has partnered with Hidden Hunger Global in an effort to bring optimal nutrition to the children we serve. It was a miracle witnessing these children, dressed in torn and tattered uniforms, some barefooted – others in shoes – taking porridge, which would now truly feed their minds and bodies. The pupils staged a school presentation and their singing was out of this world. These young and humble pupils had voices! Awesome voices.,. Life in Nanyuki wouldn’t have been a complete experience without a visit to Slopesview Academy, a boarding school where over 15 Matanya’s Hope students from various localities in Kenya gather to learn. We had a great time distributing gifts and sharing motivation and stories with students. The school choir sang, their royal blue uniforms blowing gently as they swayed to and fro. 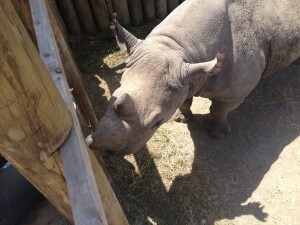 A visit to Ol Pejeta Animal Conservancy marked the perfect end our stay at Nanyuki. Our team celebrated the sight of chimpanzees, rhinos, elephants, lions and more! Michelle even got a kiss from Baraka, the area’s favored black rhino. This is Baraka. He is blind but quite a charmer. The first phase of mission 2014 was culminated with a visit to Lilian’ s home where we met her grandma (Cucu – pronounced sho sho) and the rest of her family. We traveled to a local primary school where Lilian spent the early years of her education and blessed the children with pencils and pencil cases from THE KINDNESS CONNECTION as well as toothbrushes from SUNSTAR. From this humble beginning, Lilian has so much to tell but all that is envisaged in her forever-bright smile. It was a time to say goodbye to Kelsey and a Faith but the memories of their 2 plus weeks here will be cherished for a long time. Now, Matanya’s Hope has entered the phase of MISSION PROPER. Our schedules go day and night as we interview students, pass out donations and travel through the country bringing love and blessings along the way. Keep it posted here for more updates. This entry was posted in Matanya's Hope on July 1, 2014 by Michelle Stark.